Are We All Value Pluralists Now? 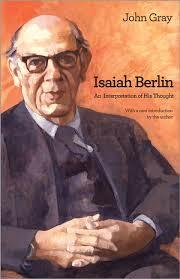 A year ago, I ranked Isaiah Berlin near the top of my 20th century intellectual heroes, a thinker with profound insight into liberal democracy and its European antipodes, Fascism, Nazism and Communism. Then, I read David Caute’s “somewhat revisionist” portrait of Berlin in Isaac & Isaiah, The Covert Punishment of a Cold War Heretic, reviewed here in December. The Berlin in Caute’s book is, I wrote, “far from an endearing figure,” a smug, vindictive, slightly arriviste member of the British establishment. Having finished Caute’s book, I discovered that John Gray, an eminent professor of political theory at the London School of Economics, now retired, had updated his 1996 analysis of Berlin’s thinking, Isaiah Berlin: An Interpretation of His Thought, with a new introduction (in a review of Caute’s book, Gray also mounted a vigorous defense of Berlin: http://www.literaryreview.co.uk/gray_07_13.php). The republication of Gray’s book thus seemed an opportune moment to deepen my understanding of Berlin’s thinking. Alas, after reading the book, Sir Isaiah continued his downward slide on my heroes list. Although I noted no further personal deficiencies, I found Berlin’s thinking anachronistic, a still-useful reminder perhaps that utopian schemes based on man’s perfectibility can lead to totalitarianism, but not much more. The chief insight which Gray attributes to Berlin, that no overarching principles can reconcile conflicting values, may represent solid armchair philosophy but seems of little utility in the real if messy world in which liberal democracies function. Berlin was born into a prosperous Jewish merchant family in Latvia in 1909, and spent formative young years in St. Petersburg, which his family left for Great Britain in 1921 amidst the chaos that followed in the aftermath of the 1917 Bolshevik Revolution. Berlin spent most of his adult life at Oxford, except for brief stints in New York and Washington during World War II and an even shorter period in Moscow in 1945, after the war. Berlin lost both grandfathers, an aunt, an uncle and several cousins in the Holocaust. Having seen the havoc precipitated by the Bolshevik Revolution close up and first hand as a young boy, as an Oxford scholar Berlin retained a life-long aversion to Marxism and Communism, an aversion which he extended to utopian schemes and ideological thinking of all stripes. Berlin liked to say that he transitioned in mid-career from a political philosopher to an historian of ideas. The difference can sometimes be difficult to grasp, but the six chapters in Gray’s book seem to fit neatly into one or the other category. The first two, “The Idea of Freedom” and “Pluralism,” along with the last chapter, “Agnostic Liberalism,” capture Berlin’s thinking as a political philosopher. The three middle chapters, “History,” “Nationalism” and “Rationalism and the Counter-Enlightenment” seem to describe Berlin working as an historian of ideas. The core principles which Gray attributes to Berlin, his idea of “value pluralism” and his elevation of “negative” over “positive” freedom as the ultimate liberal value are primarily those of Berlin the political philosopher. Gray considers Berlin’s notion of “value pluralism” to be his “idée matrîssse” (p.158, his master idea), predicated upon the irreconcilability of fundamental human values. Value pluralism presumes that “ultimate human values are objective but irreducibly diverse, that they are conflicting and often uncombinable, and that sometimes when they come into conflict with one another they are incommensurable; that is, they are not comparable by any rational measure” (p.36). Berlin’s value pluralism constitutes for Gray a “single idea of enormous subversive force” because it challenges the basic claim of the “dominant liberalisms of our time” that “fundamental liberties, rights or claims of justice are (or indeed must be) compatible and harmonious” (p.36). Negative freedom for Berlin involves “choice among alternatives or options that is unimpeded by others” (p.51; Gray uses the words “freedom” and “liberty” interchangeably). Berlin once argued that the “fundamental sense of freedom is freedom from chains, from imprisonment, from enslavement by others. The rest is an extension of this sense, or else metaphor” (p.55). Although the liberal tradition, complex and itself pluralistic, accommodates many conceptions of freedom, the negative one for Berlin is the “most defensible and most congenial to liberal concerns of diversity and toleration . . . most consistent with the rivalrous diversity of human purposes and goods” (p.57-58). Negative freedom “facilitates human self-creation by choice-making among goods and evils that are rationally incomparable” (p.177). Positive freedom is a more elusive concept, which Gray defines as the “freedom of self-mastery, of rational control of one’s life” (p.52). Positive freedom implicates “collective self-rule” (p.56). But positive freedom can be utopian-prone, linked to the notion that there is a single path to freedom, “one, and only one course of action, one form of life, for the individual” (p.57). Berlin muddied the distinction, however, when he contended that the two forms are at “no great logical distance from each other – no more than negative or positive ways of saying the same thing” (p.53-54). Gray wraps Berlin’s core principles together into an approach labeled “agnostic liberalism” — that there can be “no overarching principle of liberty, and no structure of fundamental rights or set of basic liberties, fixed or determinate in their content and harmonious or dovetailing in their scope” (p.61). Agnostic liberalism rejects the idea of a “perfect society, or a perfect human life” (p.106), and substitutes a “stoical and tragic liberalism of unavoidable conflict and irreparable loss among rivalrous values” (p.36). But to temper what might sound like nihilism, and avoid a collapse into overtly anti-liberal forms of governing, such as Hitler’s National Socialism, Berlin allowed that an agnostically liberal society must maintain a “minimal universalism” (p.191), or “minimal standards of decency” (p.202). Berlin’s anti-utopian, agnostically liberal approach is reflected in his ambivalent interpretation of the 18th century Enlightenment. Berlin was committed to the Enlightenment’s “central element,” which Gray describes as “illumination of the human world by rational inquiry” (p.45). But Berlin rejected what he saw as the “universalist or uniformitarian anthropology of the Enlightenment” (p.165), its expectation that human beings would “converge on a universal identity as members of a cosmopolitan civilization” (p.199). The Enlightenment in Berlin’s view “consistently underestimated the significance of cultural difference” (p.144). Differences in culture and language should be preserved and lauded, Berlin contended, not suppressed or reduced to a common denominator. In this sense, Berlin’s thought aligns with that of the German Romantics and thinkers hostile to the Enlightenment. But Berlin’s agnostic liberalism and value pluralism were also a challenge to religious traditions which posit a “best way of life, one force good for all human beings” (p.153), and in this sense are entirely consistent with conventional views of the Enlightenment. Berlin’s view of history reflects this skepticism toward the universalism of the Enlightenment (and also reflects his value pluralism, agnostic liberalism, and anti-utopianism). Berlin regarded history as a discipline apart from both the natural and social sciences, affirming a method of inquiry based on “empathy and imagination” (p.116). He rejected as “indefensible” theories of development which postulate general historical laws, whether of progress or decline (p.115). Berlin thus had no use for Whig interpretations of history as embodying improvement or progress. He found such interpretations incoherent because of the lack of “any overarching standard whereby global progress or regress could be judged” (p.118). The idea of a “single human history” was for Berlin as “misconceived and incoherent as the idea of a perfect human life, which it is the deepest import of his pluralism to subvert” (p.109). Berlin’s value pluralism may still be an idea of “enormous subversive force” because of its underlying premise that there can be no overarching standard to harmonize conflicting values. But modern liberal democracies have built into their systems a soft version of Berlin’s value pluralism, allowing room for divergent views to express themselves and compete for influence. Democracies can accept Berlin’s fundamental premise that a collision between basic human values that are legitimate and worthy of respect in the liberal state may not reconcilable by any overarching principle. Democracies, however, do not have the luxury of fretting over the lack of such principles to resolve value conflicts. Accommodating competing values is what democracies do; or, more precisely, liberal democracies should provide a process by which conflicting values can be accommodated. That the accommodation may be imperfect and impermanent is itself consistent with Berlin’s notion of value pluralism. Liberty and equality are for Gray the prototype examples of “inherently rivalrous goods” which “often collide in practice” and “cannot be arbitrated by any overarching standard” (p.79). But the list goes way beyond to include national security versus the right of the individuals to spheres of privacy and to know what their government is doing; the right of criminal suspects to a fair process versus the general right of the public to security; the right to exercise one’s religion versus the right of unwilling citizens to be free from state imposition of religion; and the “hate speech” conundrum, the right of unfettered free speech versus the right of minorities to be free from verbal vilification. And on and on. Although Berlin was himself no proponent of an unregulated capitalism, his negative freedom aligns closely with the classical liberal view of a minimalist state, associated with such thinkers as Herbert Spencer and William Graham Sumner in the 19th century, and Friederich Hayek and Ayn Rand in the 20th (sometimes termed “libertarianism” in contemporary North America). If liberal values of equal good are inherently irreconcilable and incapable of harmonization, it becomes difficult to argue that the state should privilege any one such value over any another. Instead, the state should privilege “choice-making as the embodiment of human self-creation” (p.176). The counterpart to the minimalist view is by definition more statist. It can embrace Marxist models that verge into totalitarianism, but also includes modern social democracy, in which the state regulates economic activity in the public interest and provides some sort of social safety net to meet “minimal standards of decency” (p.202), to use Gray’s phrase. When they work well, modern democracies accommodate Berlin’s two notions of freedom, maximizing to the extent possible the spheres in which the state abstains from constraining individual choice while regulating economic activity in the public interest and providing some sort of safety net to cushion capitalism’s vicissitudes, so that even the least economically fortunate have the opportunity for the self creation which lies at the heart of Berlin’s preference for negative freedom. This is the model of modern social democracy, the model underlying the European Union’s approach to governance, and one embraced, however timidly, by elements of today’s Democratic Party in the United States. Political theory need not be a blue print for day-to-day governance, but it should nonetheless have some relevance to governing. Berlin’s warnings about the dangers of ideological and utopian schemes, based on misplaced notions of human perfectibility, remain useful reminders. But in today’s democratic world – a significant portion of the planet – ideological and perfectionist schemes of the type that worried Berlin have little influence. The insight underlying Berlin’s value pluralism, that we will never satisfactorily harmonize conflicting values, appears oddly detached from the world in which democracies must operate. From the perspective of the mid-point of the 21st century’s second decade, the agnostic liberalism which Gray attributes to Berlin may still be stoical and tragic, but it also seems to border on irrelevance.